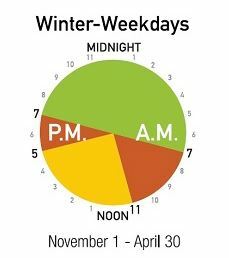 Calculate an estimated monthly electricity bill with this tool from the Ontario Energy Board. Kingston Hydro electricity customers receive their bill through Utilities Kingston. Most benefit from the convenience of one combined bill for all their utility services, which may also include water, wastewater, and gas. A combined bill helps lower costs for all rate payers. View a live TOU Indicator from the Ministry of Energy. Kingston Hydro bills its standard supply service residential and small business customers based on Time-of-use (TOU) pricing for the electricity commodity portion of their bill. This means that customers are charged less for the electricity commodity at times when the demand for it is less. For example, you’ll save money by doing your laundry on weekends or later in the evening. The Kingston Hydro website provides definitions of energy terms that are found on the electricity bill for low volume electric customers. If you have a contract with an energy retailer or are thinking about signing with one, your bill will look a little different than customers billed on TOU pricing. A customer signed with a retailer is charged the contract price for the electricity commodity portion of your bill and also a global adjustment charge. If you are approached to sign or renew a gas or electricity contract for your home or small business, it is important to know who you are dealing with. Energy company salespeople must wear an ID badge and give you a business card. See the OEB web site for four things to remember if you are approached to sign an energy contract. Additionally, in order to provide low volume consumers with information regarding their retail energy options, the OEB provides lists of active licensees that market gas or retail electricity to low volume consumers. The total amount on your energy bill comes from four costs, of which only a portion is retained by Kingston Hydro. Visit Ontario Ministry of Energy’s “Your Bill. Your Grid.”to learn more. The Debt Retirement Charge (DRC) will end for all electricity users on March 31, 2018. No electricity customer will be charged the DRC on electricity consumed on or after April 1, 2018. All our residential customers have smart meters to automatically record electricity consumption on an hourly basis. This helps consumers take advantage of TOU pricing. When you get your residential or small business bill, it measures electricity in “Kilowatt Hours” – what is that? For more details, visit Smart Meters, at the OEB web site. The 5-year Ontario Clean Energy Benefit (OCEB) reduced customers’ electricity bills by up to 10% while the province transitioned to clean energy sources and new infrastructure. This program concluded at the end of December, 2015, as planned. Electricity customers from lower income households are encouraged to apply online for the Ontario Electricity Support Program (OESP) at OntarioElectricitySupport.ca. For assistance with completing the application, customers can contact Kingston Community Health Centres at 613-542-2949, extension 1202. Leave a message and a representative will return your call within 48 business hours to book an appointment.